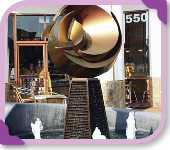 “Rondelle” is installed in front of the Bloomfield Place commercial building located on the southwest corner of Artesia Boulevard and Bloomfield Avenue. The Coffee Bean & Tea Leaf and Chipotle are housed at this location. The piece was created by artist Lyle London and is fabricated of stainless steel and aluminum with Chromillusion paint in a butter rose color. 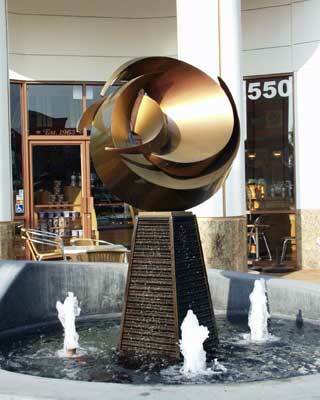 It measures 84 inches tall and 36 inches wide and stands in a fountain with artistic lighting for night viewing. London also sculpted “Ocean Dancer,” which is located across the street on the northeast corner of Artesia Boulevard and Bloomfield Avenue. “Rondelle” was designed to complement the “Ocean Dancer” sculpture, in addition to enhancing the architecture of the new building.